Methylmercury is special among organic mercury compounds because large numbers of people are exposed to it and its toxicity is better understood. Methylmercury in food, such as fish, is a particular health hazard because it is easily taken up into the body through the stomach and intestines. Moreover, there is some evidence at present that methylmercury can cause cancer in humans, but it is far from conclusive: the International Agency for Research on Cancer (IARC) has classified methylmercury as “possibly carcinogenic to humans” (Group 2B). Methylmercury’s poisonous potential was highlighted by an incident in Minamata (Japan), in the 1950s, where wastes from a chemical factory using mercury were discharged into the local bay. Elemental mercury is also poisonous to the nervous system. Humans are mainly exposed by inhaling vapors. These are absorbed into the body via the lungs and move easily from the bloodstream into the brain. However, when elemental mercury is ingested, little is absorbed into the body. Mercury occurs naturally in the earth’s crust. It is released into the environment from volcanic activity, weathering of rocks and as a result of human activity. Human activity is the main cause of mercury releases, particularly coal-fired power stations, residential coal burning for heating and cooking, industrial processes, waste incinerators and as a result of mining for mercury, gold and other metals. Once in the environment, mercury can be transformed by bacteria into methylmercury. Methylmercury then bioaccumulates (bioaccumulation occurs when an organism contains higher concentrations of the substance than do the surroundings) in fish and shellfish. Methylmercury also biomagnifies. For example, large predatory fish are more likely to have high levels of mercury as a result of eating many smaller fish that have acquired mercury through ingestion of plankton. People may be exposed to mercury in any of its forms under different circumstances. However, exposure mainly occurs through consumption of fish and shellfish contaminated with methylmercury and through worker inhalation of elemental mercury vapours during industrial processes. Cooking does not eliminate mercury. Elemental and methylmercury are toxic to the central and peripheral nervous systems. The inhalation of mercury vapor can produce harmful effects on the nervous, digestive and immune systems, lungs and kidneys, and may be fatal. The inorganic salts of mercury are corrosive to the skin, eyes and gastrointestinal tract, and may induce kidney toxicity if ingested. Neurological and behavioral disorders may be observed after inhalation, ingestion or dermal exposure of different mercury compounds. Symptoms include tremors, insomnia, memory loss, neuromuscular effects, headaches and cognitive and motor dysfunction. Mild, subclinical signs of central nervous system toxicity can be seen in workers exposed to an elemental mercury level in the air of 20 μg/m3 or more for several years. Kidney effects have been reported, ranging from increased protein in the urine to kidney failure. All humans are exposed to some level of mercury. Most people are exposed to low levels of mercury, often through chronic exposure (continuous or intermittent long term contact). However, some people are exposed to high levels of mercury, including acute exposure (exposure occurring over a short period of time, often less than a day). An example of acute exposure would be mercury exposure due to an industrial accident. the route of exposure (inhalation, ingestion or dermal contact). Generally, two groups are more sensitive to the effects of mercury. 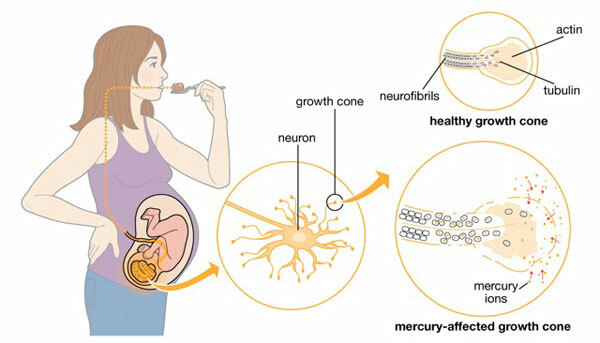 Fetuses are most susceptible to developmental effects due to mercury. Methylmercury exposure in the womb can result from a mother’s consumption of fish and shellfish. It can adversely affect a baby’s growing brain and nervous system. The primary health effect of methylmercury is impaired neurological development. Therefore, cognitive thinking, memory, attention, language, and fine motor and visual spatial skills may be affected in children who were exposed to methylmercury as foetuses. The second group is people who are regularly exposed (chronic exposure) to high levels of mercury (such as populations that rely on subsistence fishing or people who are occupationally exposed). Among selected subsistence fishing populations, between 1.5/1000 and 17/1000 children showed cognitive impairment (mild mental retardation) caused by the consumption of fish containing mercury. These included populations in Brazil, Canada, China, Columbia and Greenland. For many years, no one realized that the fish were contaminated with mercury, and that it was causing a strange disease in the local community and in other districts. At least 50 000 people were affected to some extent and more than 2000 cases of Minamata disease were certified. Minamata disease peaked in the 1950s, with severe cases suffering brain damage, paralysis, incoherent speech and delirium. Mercury pollution can be a serious health threat, especially for children and pregnant women. Mercury is emitted to the air by power plants, cement plants, certain chemical manufacturers and other industrial facilities. In addition, over the years, many companies have used mercury to manufacture a range of products including thermometers, thermostats and automotive light switches. These products can release mercury, particularly at the end of their useful life during waste handling and disposal. Mercury pollution released into the environment becomes a serious threat when it settles into oceans and waterways, where it builds up in fish that we eat. Children and women of childbearing age are most at risk. Once mercury enters a waterway, naturally occurring bacteria absorb it and convert it to a form called methyl mercury. This transition is particularly significant for humans, who absorb methyl mercury easily and are especially vulnerable to its effects. Mercury then works its way up the food chain as large fish consume contaminated smaller fish. Instead of dissolving or breaking down, mercury accumulates at ever-increasing levels. Predatory fish such as large tuna, swordfish, shark and mackerel can have mercury concentrations in their bodies that are 10,000 times higher than those of their surrounding habitat. 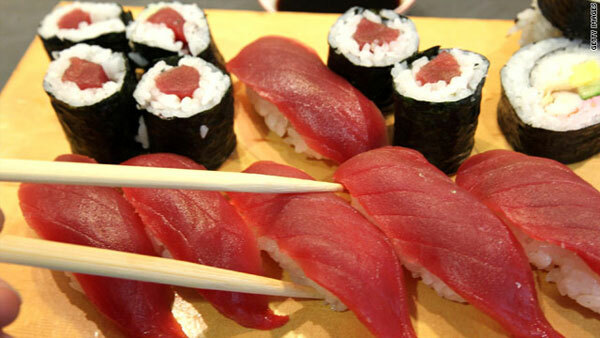 Humans risk ingesting dangerous levels of mercury when they eat contaminated fish. 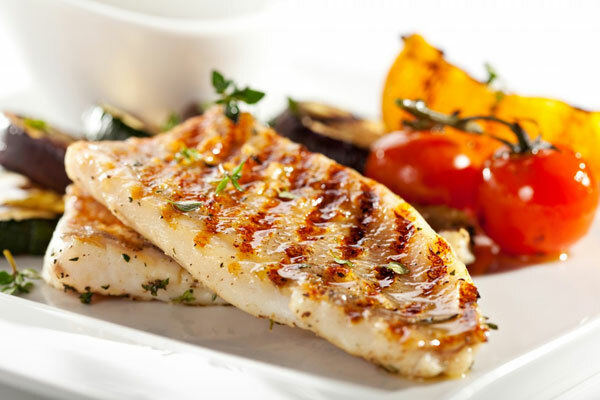 Since mercury is odorless, invisible and accumulates in the meat of the fish, it is not easy to detect and can’t be avoided by trimming off the skin or other parts. Once in the human body, mercury acts as a neurotoxin, interfering with the brain and nervous system. Exposure to mercury can be particularly hazardous for pregnant women and small children. During the first several years of life, a child’s brain is still developing and rapidly absorbing nutrients. Even in low doses, mercury may affect a child’s development, delaying walking and talking, shortening attention span and causing learning disabilities. Less frequent, high dose prenatal and infant exposures to mercury can cause mental retardation, cerebral palsy, deafness and blindness. In adults, mercury poisoning can adversely affect fertility and blood pressure regulation and can cause memory loss, tremors, vision loss and numbness of the fingers and toes. A growing body of evidence suggests that exposure to mercury may also lead to heart disease. A 2009 study of federal Centers for Disease Control and Prevention (CDC) data concluded that roughly one in 40 women of childbearing age have mercury in their blood above 5.8 micrograms per liter of blood — a level that could pose a risk to a developing fetus. This is a significant improvement from data ten years ago, which showed that one out of 15 women had mercury in their blood at this level. Newer science indicates, however, that mercury actually concentrates in the umbilical cord blood that goes to the fetus, so mercury levels as low as 3.4 micrograms per liter of a mother’s blood are now a concern. Nearly one in 13 women of reproductive age in the United States has mercury in her blood at or above this level, according to the latest data. Dr. Jane Hightower, a doctor of internal medicine at the California Pacific Medical Center in San Francisco also linked fish consumption to elevated mercury levels when she tested her own patients. Her 2003 study found that 89 percent of the participating patients — chosen because of their fish-heavy diets — had elevated mercury levels. Many had levels as much as four times that which the Environmental Protection Agency considers safe. The good news is that Dr. Hightower and other health professionals conclude that high mercury levels are reversible: cutting consumption of mercury-contaminated fish causes blood mercury to drop, though it can take six months or more. Neurological and behavioral disorders may be observed after inhalation, ingestion or dermal exposure of different mercury compounds. Symptoms include tremors, insomnia, memory loss, neuromuscular effects, headaches and cognitive and motor dysfunction. Mild, sub clinical signs of central nervous system toxicity can be seen in workers exposed to an elemental mercury level in the air of 20 μg/m3 or more for several years. Kidney effects have been reported, ranging from increased protein in the urine to kidney failure. There are several ways to prevent adverse health effects, including promoting clean energy, stopping the use of mercury in gold mining, eliminating the mining of mercury and phasing out non-essential mercury-containing products. Promote the use of clean energy sources that do not burn coal. Burning coal for power and heat a major source of mercury. Coal contains mercury and other hazardous air pollutants that are emitted when the coal is burned incoal-fired power plants, industrial boilers and household stoves. Eliminate mercury mining, and use of mercury in gold extraction and other industrial processes. Mercury is an element that cannot be destroyed; therefore, mercury already in use can be recycled for other essential uses, with no further need for mercury mining. Mercury use in artisanal and small-scale gold mining is particularly hazardous, and health effects on vulnerable populations are significant. Non-mercury (non-cyanide) gold-extraction techniques need to be promoted and implemented, and where mercury is still used safer work practices need to be employed to prevent exposure. A range of actions are being taken to reduce mercury levels in products, or to phase out mercury-containing products. In health care, dental amalgam is used in almost all countries. A 2009 WHO expert consultation concluded that a global near-term ban on amalgam would be problematic for public health and the dental health sector, but a phase down should be pursued by promoting disease prevention and alternatives to amalgam; research and development of cost-effective alternatives; education of dental professionals and the raising of public awareness. Mercury use in some pharmaceuticals, such as thiomersal (ethyl mercury), which is used as a preservative in some vaccines, is very small by comparison with other mercury sources. There is no evidence that suggests a possible health hazard resulting from the amounts of thiomersal currently used in human vaccines. Inorganic mercury is added to some skin-lightening products in significant amounts. Many countries have banned mercury-containing skin-lightening products because they are hazardous to human health. This resource on mercury in food shall provide an insight to our readers to be aware of mercury health hazards and avoid such foods.